The Chanel Spring 2013 Couture show was absolutely beautiful and breathtaking. 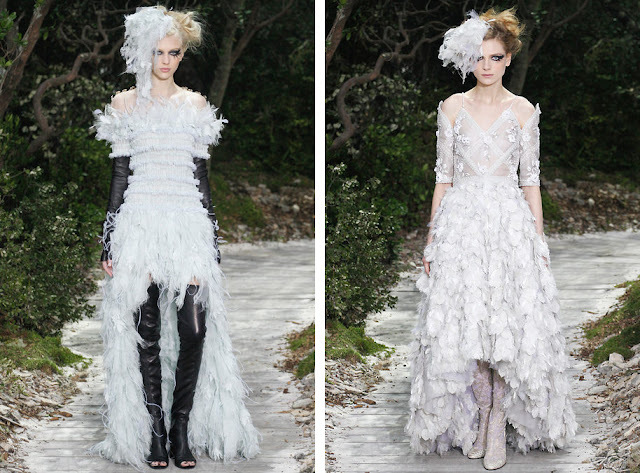 The models wandered through the woods with a strong yet romantic look. The feathered hair piece to the side covered half of the girls' faces, letting one eye show with dramatic bird-like black lashes. The attention was mostly drawn to the shoulders, making "shoulders beautiful" as Karl Lagerfeld said in an interview with The New York Times. Karl Lagerfeld closed the show with not one but two brides wearing identical and ravishing wedding gowns. Hand in hand, they walked through the woods, as though walking down the aisle, with a little boy who looked like the ring carrier. Lagerfeld showed his support for the controversial French gay marriage law and said he doesn't even "understand the debate". Lagerfeld will never fail to surprise and amaze.